I love writing in multiple genres at the same time. It works my brain all the way around, sloshing the creative juices everywhere. Now that Supremacy: Reformation is officially off the ground, I need to tell you about my cross-pollination with urban fantasy. 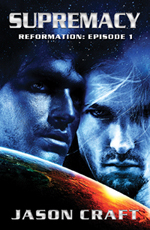 About three years ago, I wrote a short story involving angels and demons, completely ignorant of just how big the urban fantasy genre had become. The story itself wasn’t really that great, so I shelved the idea hoping it would ferment a little more. Well, after the whole Twilight craze drove me insane, I knew I had to bring something different to the UF table to wash away the embarrassing image of sparkling vampires. I promptly dug up my story and presented to my writers’ group an idea of creating our own UF anthology set in my world. We put our three imaginations together and created Shadeskin, a story of light and shadow set in our hometown of Shreveport, LA. 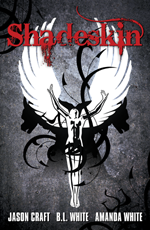 It is a collection of five inter-weaving tales that re-envision the typical angel/demon archetypes. Trust me, you haven’t read anything like this before. As proof, here is a preview of the first story, Walk the Crimson Path, written by yours truly. The axehead scraped along the concrete, leaving behind a trail of warm blood. Blackened viscera clung to its sharp edges. Awash in red, a thin hand wrapped tightly around its handle and pulled it along with a stammering jerk. Escaping the carnage behind them, pale feet stumbled before the crimson path. The rising sun kissed the face of the young woman dragging the axe. Shadows crept around her, hiding from the growing rays of light. Her long, black hair, matted with blood, lay flat against her back. She staggered along until finally reaching the street curb. “So, this is destiny,” she whispered, a forced smile curving her lips. Several bystanders gathered around her. Proud to be a spectacle, she smiled and drank in their fear and confusion. One man summoned the courage to follow the bloody trail into the nightclub. He didn’t last long before running back outside and vomiting over the pavement. She admired his tenacity. On any normal day, he or anyone else in the crowd might have been able to alert the authorities, but she knew the force permeating their minds weighed them down. Their eyes were glazed over. In the still air, the young woman’s hair began to sway at the approach of a powerful entity. A cloud of unnatural darkness materialized behind the bystanders, drawing their gaze. A man stepped regally from the cloud and walked toward her. The crowd parted to make way for his purposeful stride. Renewed fear sparked inside everyone, save for her. “Where does your destiny take you?” he asked. “To you,” she replied, feeling her ties to the physical realm loosening. It felt like she was awakening from a dream. He brought her in for an intimate kiss. The moment their lips connected, a peaceful wave rolled through her. Quivering under his power, she let go of the axe and wrapped her arms around his strong neck. The axe handle slapped the concrete, flinging droplets of blood. A surge of warmth resounded within her heart, healing all the torment she had so recently endured. The sun’s light faded, withdrawing its warm touch from her face. She held on to him for stability as the pavement dissolved. A multitude of sensations charged through her. Opening her eyes, she was alone in darkness. Then, she began falling. Clara’s furious eyes bore through her mother’s gentle stare. Her father had quickly bowed out of the argument to steel himself in the living room. Her mother clutched at the side of her burnt-orange skirt with nervous fingers. A tear formed in the corner of her eye, but she escaped Clara’s room before it fell. Clara instantly regretted driving her mother to tears again. She heard her father trying to calm her down in the living room. Clara stood fuming in the middle of her room, waiting for the inevitable. After a few minutes, her father appeared in the doorway. Tall and slender, he was the pole that kept their rocking gondola stable. “I try not to fight with her, Dad,” Clara offered. “True,” she laughed, looking up into his dark, comforting eyes. A cloud of stubble shadowed his face. “Just eccentric,” she playfully responded, her anger subsiding. “Nathan, we need to go,” her mother called from the kitchen. “Make a little time tonight to stop by the club and tell her yourself.” Nathan leaned in and kissed her on the forehead. He gently squeezed her shoulder before rushing off. Clara sighed and fell backward onto her bed, cushioned by a mountain of pillows. Her ceiling fan rotated, laughing at her with its periodic squeaking. She lifted a round pillow over her head and punched it a few times before laying it on her stomach. She could almost feel the ‘negative energy’ swirling around the room. Her mother certainly had an odd way of seeing the world. From the moment she was born, Clara was set up for failure. Her parents thought the world of their only child, but they never grounded her in reality. Instead, they spoiled her into thinking she was special with bedtime stories about how she would someday save the world. While harmless for a young child, the stories didn’t stop as she grew older and instead transformed into prophecy. As a budding teen, Clara’s talent for re-telling her destiny just seemed weird. The captivated audience she was used to began rolling their eyes and trying to switch the subject to music and boys. Clara, the fated savior of the world, watched her social life go up in flames. The ‘special’ food she carried to school each day tasted more like ash the longer she was alone. No one believed her anymore about how her food kept her safe from dangerous toxins. The fact she had never seen a real doctor created rumors she couldn’t escape. At first she hated the kids at school for their cruelty, but by high school, she realized her parents had done this to her with their crazy beliefs. The constant supply of rumors branded her an outcast. Ostracized, she accepted her true fate as the weird kid. She hated her parents every lonely minute of high school. However, they were still her parents and for all their numerous flaws, at least they nurtured her academic side. By the time she graduated, she had outpaced her classmates in every scholastic measure. Thankfully, college evened things out, allowing her a taste of normal life with actual friends. She started life anew with a clean slate. No longer would she allow anyone to know her as the ‘false destiny chick.’ The sooner she moved away from her parents, the sooner her childhood scars would heal. The muffled sounds of closing doors announced Clara was alone in the house. Friday nights initiated the nightclub cycle, and her parents offered the best, non-conformist experience down at the Hookah Palooka. They hated it when Clara referred to it as a ‘hippie bar,’ even if it was true. She sat up on the edge of her bed and looked in her vanity mirror. Frizzled auburn hair fell just past her shoulders. Murky rings cupped her brown eyes, reminders of her argument with her mother. Still, she remained fixed on her goal of shining in her interview with Mandrake. A pop song burst through the silent air, signaling an incoming call. Clara reached for her phone, her face lighting up after seeing the caller ID. “Just avoiding my mother. We clashed pretty fantastically today.” Her voice shook more than she realized. “Of course. She wants to shelter me from everything, and I am beginning to realize that nothing I ever say will change her mind.” The memory of that earlier conversation burned inside her head. “Hey, optimism always wins out, and when it comes to intellect, you have it all,” Drake said firmly. “You need to unwind sometime in the near future.” He seemed a bit pleading. “I was hoping you would,” she said, bringing the conversation to a close. Hopefully he wasn’t as dejected as he sounded. She hung up before realizing she had not reciprocated. She started to call him back, but the doorbell rang. She rose from her bed with a sigh and headed to the front door. A haze of sunlight filtered into the living room through vertical blinds covering a pair of French doors. Past the doors lay a well-kept back yard. A couch and a pair of easy chairs sat around a glass coffee table in the center of the room. Her mother’s tea grew cold in a yellow mug near the table’s edge. The doorbell rang a few more times before Clara made it to the door, inciting her to fling it open in frustration. Louisiana’s humid summer air greeted her with its wet kiss. She stepped outside and looked around the bend of the house to find no one. Studying for this interview must be more draining than she thought. She moved back to her room. Opportunity wafted from the stack of books surrounding her computer as she sat at her desk. She cracked open the book on mathematical graph theory she had been reading before her mother’s earlier interruption. Pages of handwritten notes sat wedged throughout, representing the milestones of her college course. Most students never understand the close relationship math shares with computer science, but when it comes to digital security, the two are inseparable. Her mind floated into the pages of her studies. Information flooded back to her while she read, reminders of a simpler time. Only now did she see the real-world application of what she had learned, and Mandrake would be most interested in the interview candidate who clearly demonstrated such insights. Competition was fierce, but so was she. Well, at least Drake believed in her. The doorbell rang again, breaking her concentration. Annoyed, she threw her book onto her bed and went back to open the door. A cloud passed overhead, toning down the cheery light in the living room. She opened the door and again saw no one. She let out a frustrated sigh. Instantly, a loud banging noise snapped her attention to the French doors. A human shadow cast on the blinds wildly slammed its fists into the glass. Clara froze in place, paralyzed with fear. “Help me!” the shadow screamed desperately before collapsing onto the ground. Clara’s limbs awakened at once and she rushed to the French doors, quickly sliding the blinds aside. Instead of lying on the ground, the figure leaned upright against the glass, startling her. She fell backward onto the hardwood floor in surprise. A thin young woman with long, dark hair looked down at her through a pair of black over-sized sunglasses. A chill tingled Clara’s spine, sucking her breath away. She screamed inwardly, commanding herself to move, but she remained pinned to the floor. Fear sliced into her heart like a knife. The woman swung an axe into the French doors. Harsh lines of cracked glass grew outward from the center of the door. With a twisted smile, she thrust the axe straight into the door, blowing tiny shards of glass into the house. Clara felt a dark presence reach in and touch her soul. She rolled onto her hands and knees, clawing at the floor in a frantic dash to the front door. The woman laughed softly behind her. Clara grabbed the edge of the coffee table and pulled herself up. The woman buried the axe deep into her lower back. Clara slammed onto the coffee table, spilling her mother’s tea. She screamed through the pain, trying to crawl across the table. Bare feet landed on either side of her. The axe tore into her side, cracking through bone. Clara curled around it, trying to hold it in place. With a quick jerk, the axe swept out again, taking with it a chunk of flesh. Clara lurched onto her back and screamed until blood poured from her mouth, choking her voice. Feeling the cold metal of the axehead press against her neck, she looked up in terror at her assailant. The woman bent down, placing her lips next to Clara’s ear. The woman jumped off the table and exited through the front door, leaving it open. Clara looked outside, feeling throbbing pain numb her body. Carefree birds sang her eulogy. She reached for them, wishing they would save her. Blood seeped between her fingers over the glass of the coffee table. Daylight faded away, leaving her in darkness. I hope you enjoyed this snippet. 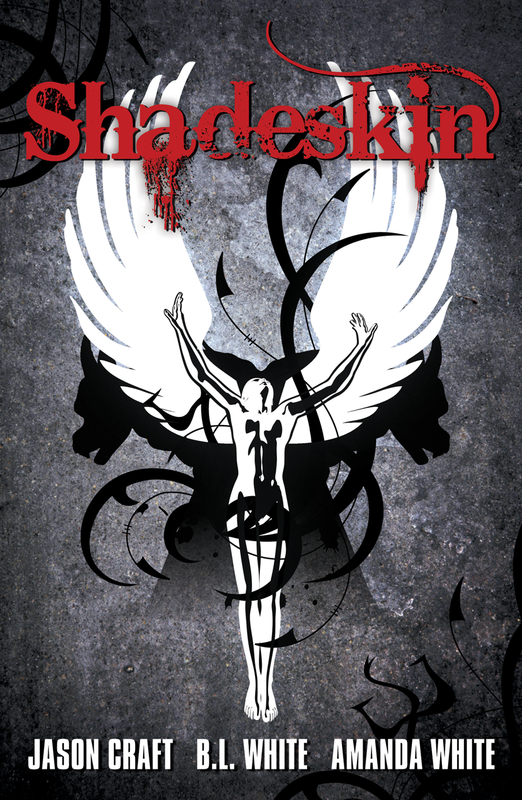 For the full experience, look for the release of Shadeskin soon in print and ebook.